Generic news and stories on careers in History. Distinct from Events, Internships, etc. Hopefully you’ve been thinking about this question before your last semester in school, but if you need some additional food for thought, there’s a new article on History degrees and careers in the April 2017 issue of American Historical Association’s Perspectives on History magazine (here). 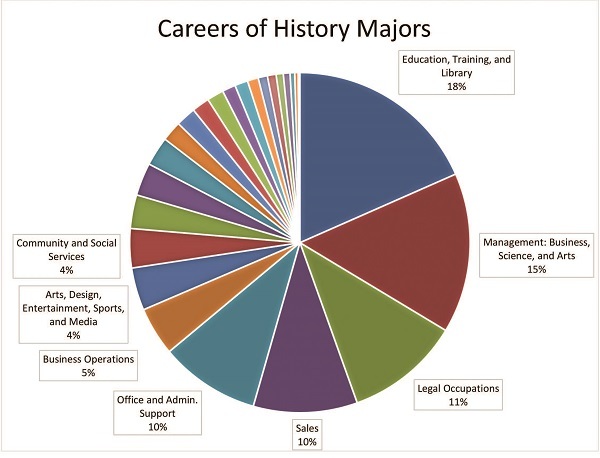 Appropriately enough, it takes a historical approach by looking at what careers past History majors have pursued. So read the article and do what History trains you to do: identify its conclusion, assess its supporting evidence, analyze its assumptions and inferences, and contextualize the information within its broader geographical and chronological contexts. Once you’ve done that, you’ll be in better shape to figure out how you can combine your interests, content knowledge, and skills to find a job you’ll like doing. And remember, History faculty are here to help. And what would a blog post be without an eye-catching graphic? Public History opportunity, ye mateys! For those interested in public history, you might consider checking out Discovering Amistad (http://discoveringamistad.org), a non-profit organization that is dedicated to providing education on its tall ship, the Amistad, and in Connecticut classrooms. The mission of Discovering Amistad is for CT students and adults to learn about the history of the Amistad, and to explore themes that extend its story to the present day, including legal and social justice. Discovering Amistad is looking for individuals to serve as educators, on board and in the classroom. Educators should have a knowledge of American history and be able to lead discussions of students of all grade levels on contemporary issues concerning race and justice. Some background in education is essential: college graduates, education students and retired teachers are encouraged to apply. For additional information, as well as application materials, contact Discovering Amistad Education Committee co-chairs Stephen Armstrong or Bob King. This April 4-7 is #Eastern2Career Week. The Center for Internships and Career Development has numerous activities planned, all of which are intended to help students find the career(s) of their dreams. Mr. Doug Craig graduated from Eastern in 2003 with a History/Social Science degree, went on to get his Master’s in History, and was Logan’s high school history teacher! Now we are counting on Logan to eventually send our way some great students of hers to continue the tradition. Congratulations, Logan!